Gully Boy stars Alia Bhatt and Ranveer Singh returned from Berlin after the screening of their film at the Berlin Film Festival on February 10, 2019. The actors were snapped at the Mumbai airport and were clicked by the paparazzi. Alia and Ranveer looked content and happy and excited as they made their way out of the airport. Ranveer looked great in a pastel green track suit with sports shoes while Alia looked pretty cool in a white track suit with a stylish pair of matching sunglasses and white shoes. The film is ready to be released in a few days and the audience cannot wait to catch it in theatres after an exciting trailer. 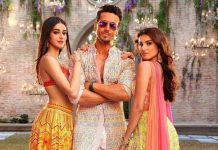 The makers of the film have so far released a number of songs and promos of the film which has increased the curiosity of the audience. The expectations from the film are rising from every passing day. The film is helmed by Zoya Akhtar and produced by Farhan Akhtar, Ritesh Sidhwani and Zoya. Gully Boy will be released in theatres on February 14, 2019.